For Architects working in the Dorset, Wiltshire and Hampshire area, Croft Preservation can provide a range of extensive building services such as extensions, conversions and reconfiguration works. Our enviable reputation for successfully delivering building works across both residential and commercial properties such as hotels, schools and more is second to none. All our building work is guaranteed under the NHBC and safety is always paramount. Croft Preservation are also members of Checkatrade and have an enviable and established reputation for delivering high-quality work. Croft Preservation are fully accustomed to working with architects in the Dorset and Hampshire area and have worked closely with several architect practices in the local area. Our expert team can work in both commercial and domestic properties and are able to provide you with a tailored approach to your property needs. Ensuring peace of mind is imperative and you can feel confident in our proven track record for successfully delivering building works on time and on budget in both commercial and domestic environments. Croft Preservation pride themselves on their personal and consultative approach and you can feel assured that you will not be confronted by any pushy sales people or will be charged for work that isn’t required. Croft employees are honest, hard-working and trustworthy in all they do and this is truly reflected in our approach to business. With over 30 years’ experience, you can feel confident in Croft Preservations’ capabilities in providing a professional and unrivalled service, delivering on both excellence and quality and your satisfaction is paramount to us. 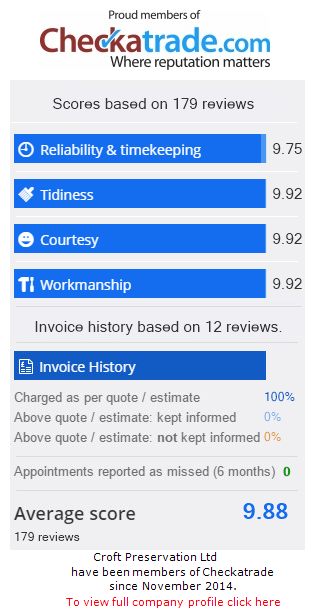 You can request a free quote today by requesting one from a member of our dedicated team and we will provide you with a comprehensive quote which will allow you to determine the level of work and the budget required to complete your building services project.